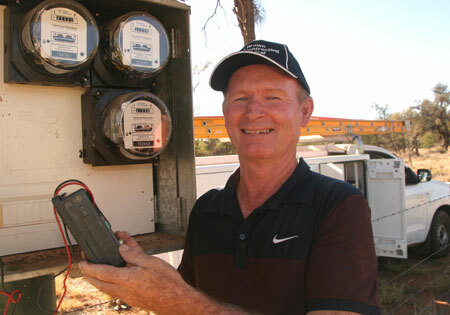 Councillor Steve Brown (pictured), who is an electrician, fell seven metres while working on a power pole on Saturday. He suffered extensive bruising and a broken bone in his foot, but comprehensive tests in the Alice Springs hospital revealed no serious injuries. Cr Brown says he was last week exonerated by the council, meeting behind closed doors, over remarks he made about Alice Water Smart, a local group formulating rules about water use. Cr Brown says he would have preferred the discussion had taken place in open council, and Cr Eli Melky also moved for the matter to be dealt with in “open”. However, a majority of councillors voted against that. Cr Brown says the decision was that he had not breached council rules, and maintained he would not be restricted in the expression of views. “My job is to represent the people who elected me,” says Cr Brown. Steve must be on holidays. Maybe he’s gone to Waco? What is a “Waco” agenda? At least you got my name spelled right this time, thanks. Well whatever his opinions, I’m glad Steve was relatively uninjured, falling off ladders is no fun at all. So in your opinion Leigh I should stand for election giving the people one point of view. Then, when I get elected, switch to representing the point of view of a few very suspect opinions on the fringes of politics? Sure I’ll represent an issue that someone like yourself may have to Council, Leigh, in a fair and even handed manner, but that doesn’t mean I’ll betray those who elected me by also representing your opinion. That is a really naive belief, often used by our fringes to try and exert their opinion even though we are a democracy which as its very basis seeks to represent the “Majority Point of View”! If you would like to see your point of view predominate in Council or anywhere else Leigh all you have to do is convince enough people to back you up just like I did Leigh! Hey, and really good luck with that! On another matter it’s thanks to the new iPad technology I can continue to comment even though temporarily Wheel Chair bound. You can expect that I will continue to do so. You might also be interested to know that I have never had so many calls comments and emails in support of what I said about “Water Rules” Water Smart. Unfortunately made a very large error in judgement when deciding to run with it, I wish them a lot of luck in turning around the general community anger they’ve managed to generate with what they assure me was essentially the wrong message! So Alice there will be “No” water rules, and there is not, and will not be, any cap set on the future growth of our town set by those pushing an imported Waco agenda. Nor will I stand by and watch an agenda like this being helped from behind the scenes by what is really a government department seeking to avoid further investment obligations to our community, another reason why the privatisation concept does not and will not work for an economy that demands rapid expansion. Perhaps just poorly chosen words, but as an elected official, his job is to work on behalf of everyone in Alice Springs, not just the people who voted for him. It is what we expect from all our representatives, at any level of government. “My job is to represent the people who elected me.” I wish that were true but I get the impression that Steve Brown sticks to Steve Brown’s agenda and the rest can go hang. I would cautiously suggest that there is more than one set of opinions out there.